Contact Marc Imlay: ialm@erols.com | Written by Marc Imlay and Kerrie Kyde. Seed-bearing racemes of Arthraxon hispidus. Photo by K. L. Kyde. 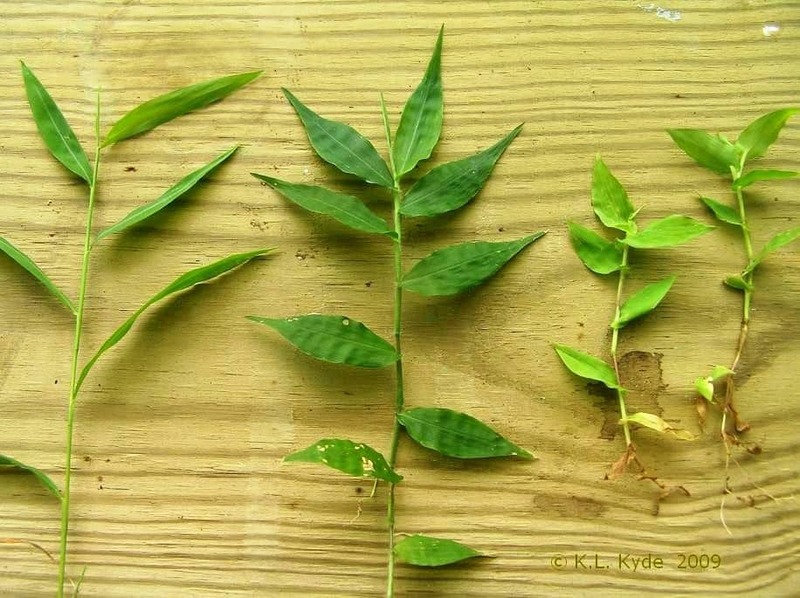 Leaves of Arthraxon fully encircle the stem, distiguishing the species from many other invasive grasses of Maryland. Photo by K. L. Kyde. ANNAPOLIS, MD (September 01, 2017) – In the last days of summer, walking in the lawn in your bare feet, you may encounter small carpetgrass, Arthraxon hispidus. 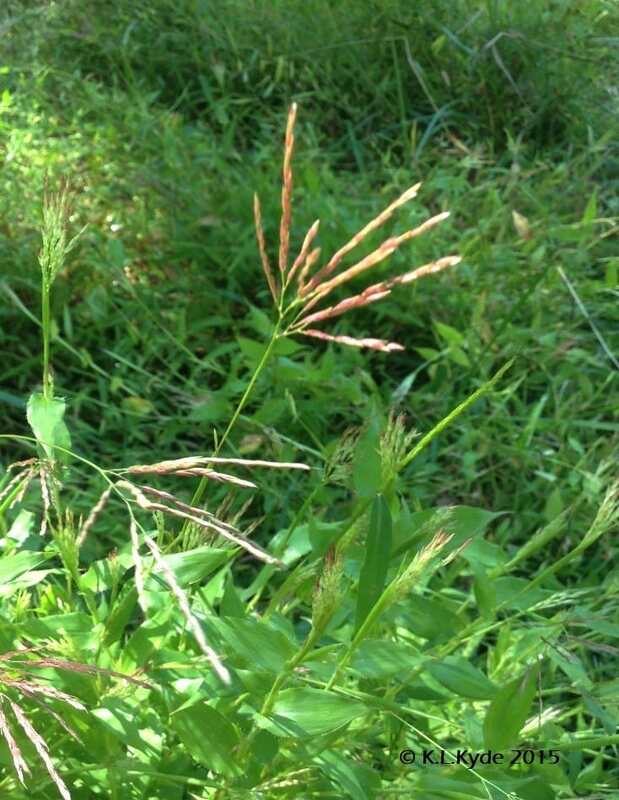 Also known as hairy joint grass, jointhead, and occasionally referred to as small carpgrass, this Asian annual has been reported as introduced in 28 states, primarily in the southeastern US. It appears on a number of non-regulatory invasive plant lists, and Connecticut and Massachusetts both prohibit its importation and sale. In Maryland, it can be highly invasive in sunny or partially shaded moist habitats. 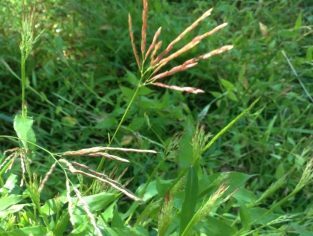 Because this grass is in bloom in early fall, the Maryland Invasive Species Council has chosen small carpetgrass as the September Invader of the Month. Small carpetgrass is a sprawling annual grass native to southeast Asia, from the maritime region of Russia west to India and to Africa. Its bright green relatively short leaves (1-3″) clasp the wiry stems, and taper to blunt points. 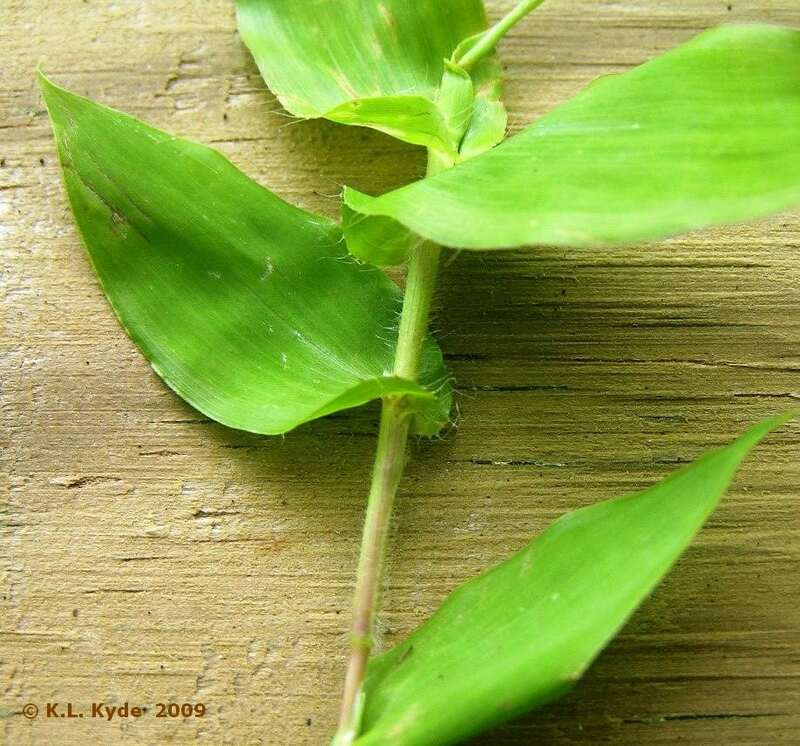 The leaf edges and sheaths have short white bristles. The grass forms dense clumps and each culm or stem can fall and root at the nodes. Arthraxon flowers in September in our region, and produces a cluster of short flowering fingers at the top of the plant, each 2-3″ long. The fingers are made of several green to purple grass spikelets, each with a tiny pointed awn. The yellowish seeds mature in mid to late fall. 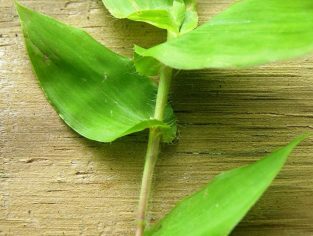 The leaf edges of small carpetgrass undulate: removed from the plant and laid out for observation, they will not lie flat. The clasping leaves and hairy leaf edges make it easy to confuse with the native species deer tongue, Dichanthelium clandestinum. The waviness of the leaf edges causes observers to mistake it for wavyleaf basketgrass, Oplismenus undulatifolius. Land managers frequently believe that they have an infestation of wavyleaf when they actually have small carpetgrass. It is often present in the same habitat as Japanese stiltgrass, Microstegium vimineum, a third similar-looking grass, but does not have stiltgrass’ bright white midrib of hairs. Arthraxon may have been brought to the U.S. from Japan for the 1876 International Exhibition in Philadelphia, and subsequently introduced as packaging material or garden escapes. By 1935, when Hitchcock described it formally, it was already widely distributed here, from Pennsylvania to Florida, with occurrences as far west as Missouri, Arkansas and Oklahoma. Although small carpetgrass does not tolerate low pH soils, it is adapted to a range of habitats with moist conditions, including floodplains, stream edges, roadside ditches, wet meadows, moist woodlands, and even joints in sidewalks. In Maryland, it is widely distributed across the state. US Fish and Wildlife Service reports that it threatens the federally listed endangered species harperella, due to its dense clumping habit and competition for the water’s edge and shallow stream environments where harperella grows. Left: Japanese stiltgrass, center: wavyleaf basketgrass, right: small carpet grass. Photo by K. L. Kyde. Small carpetgrass can be easily hand weeded, although for large infestations, chemical control with 2% glyphosate applied carefully by backpack sprayer is effective. Biological control agents exist – both insects and fungi, one of which may be host specific – but none are approved for release.